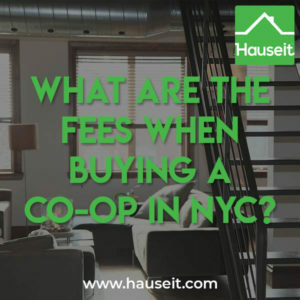 What Are the Fees When Buying a Co-op in NYC? 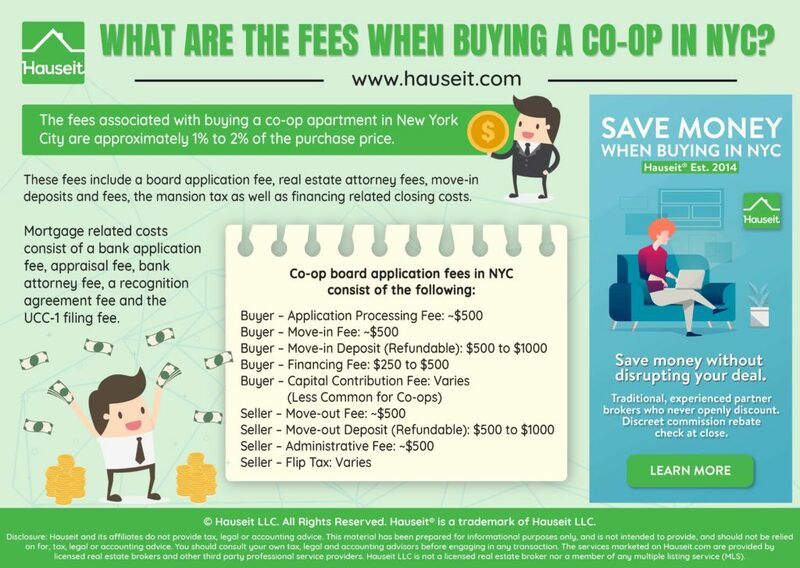 The fees associated with buying a co-op in NYC are approximately 1% to 2% of the purchase price. These fees include a board application fee, real estate attorney fees, move-in deposits and/or fees, the mansion tax as well as financing related closing costs. Mortgage related closing costs consist of a bank application fee, appraisal fee, bank attorney fee, a recognition agreement fee and the UCC-1 filing fee. How Much Are Co-op Board Application Fees? Are Coop Application Fees Refundable If I’m Rejected? How Much Are Co-op Buyer Closing Costs in NYC? What Is the Typical Real Estate Attorney Fee in NYC? How Much Is the Mansion Tax in NYC? How Much Are Lender Fees When Buying a Co-op? The average co-op board application fee is $500, paid by the buyer. In addition to the application fee, most buildings will charge both buyers and sellers fees and deposits relating to move-in and move-out. It’s fairly typical for the transfer agent to request move-in and move-out fees of ~$500 each in addition to refundable move-in and move-out deposits of $500 to $1000, respectively. In most cases, the processing fee and the move-in/move-out deposits and fees are payable at the time you submit the purchase application to the managing agent. In rare instances, co-ops also ask buyers to make a capital contribution at closing which is equal to a few months’ worth of maintenance payments. Co-ops also often charge sellers a flip tax at closing, which is an additional seller closing cost. Are Coop Application Fees Refundable If I'm Rejected? It depends. In most cases, the application fee itself is non-refundable. This is also the case for any credit check or criminal background check fees. The building will usually return your move-in deposit and move-in fees in the event your application is rejected. It goes without saying that you will not have to pay any co-op building fees which are charged at closing, since you won’t make it to that stage if the board turns down your application. Co-op buyer closing costs are 1% to 2% of the purchase price in NYC. Closing costs as a percentage of the sale price actually decrease as the purchase price increases for co-ops, since most of the buyer co-op closing costs are fixed amounts vs. a percentage of the sale price. Co-op buyer closing costs include real estate attorney fees, building application fees, financing related fees and the 1% mansion tax if you are buying a property which is at or above $1 million. The easiest way to estimate your co-op buyer closing costs in NYC is to use Hauseit’s Interactive Closing Cost Calculator for Buyers in NYC. The average real estate lawyer fee in NYC is $2,000 to $3,000, however it can be more or less depending on the nature of the individual transaction. We explain NYC real estate attorney fees in great detail in this article. Real estate offers in NYC are not binding until a contract is signed, and you won’t be able to sign a contract until your lawyer completes due diligence and negotiates the contract. Therefore, having slow or unresponsive lawyer can actually put your deal at risk by allow time for other buyers to enter the picture. The mansion tax is a 1% tax on the purchase price of residential property valued above $1 million which is customarily paid by the buyer. The New York mansion tax was imposed in 1989, and it has never been adjusted for inflation. We explain the mansion tax in detail and show how you can reduce or eliminate the tax here. The mansion tax is technically an additional real estate transfer tax. However, the traditional NYC and NYS transfer taxes are paid by sellers with exception of new developments, condo conversions and sponsor sales – in which case the buyer customarily pays them. Fortunately, taking out a mortgage on a co-op is much less expensive than for a condo. This is because the Mortgage Recording Tax does not apply to loans for co-op apartments. The mortgage recording tax is approximately 2% of the loan amount, making it one of the highest buyer closing costs in NYC. The Mortgage Recording Tax only applies to real property, which includes condos and houses. Co-ops are not considered to be real property since there is no deed and unit owners simply own shares in a corporation along with a proprietary lease entitling them to occupy a specific apartment.